The Best Postpartum Girdles For Moms: Do You Need One? You may be thinking, what are the best postpartum girdles? Or maybe you’re asking, what is a postpartum girdle? After you’ve given birth, your physique might not be as it was before and, this is totally normal. Most moms leave the hospital still looking around 5-6 months pregnant. A postpartum girdle is something that can help bring the body shrink back to its pre-pregnancy size. It can compress the abdomen, hips, and backside. It also helps your tummy and hips shrink. If you had a cesarean done, it also helps to hold in the incision so the stitches don’t come apart. There are different styles available and you can also fasten them either through Velcro, eye, and hooks, or zippers. New moms might feel not themselves because of the extra weight they have put on which is just a normal thing to be feeling. It will take time for your body to shed off the weight and your skin to be back to normal. A postpartum girdle can help in getting mom’s body back to standard quicker and helps you feel more confident and boosts self-esteem. After giving birth, your abdomen and muscles will be deflated and won’t be as flexible as normal. The postpartum girdle will help aid your muscles stay in place to its proper position and recover quicker. Your skin around the midsection could be loose and frequent movement can cause stretch marks and also damage skin elasticity. A postpartum girdle will help keep this area stable and prevent extra movement. If you had a c section, you need those stitches to stay in place while you go about your daily activities. A postpartum girdle will help prevent unnecessary movement and prevents the reopening of stitches. You will then be on your way to faster healing and recovery. Not to mention, a postpartum girdle can also help with the pressure and pain from the surgical wound. Because the postpartum girdle can help make your figure smaller, you can wear your old clothes over it and feel more confident. I remember how good it felt to slip into some of my pre-pregnancy shirts (looser ones, but still!) a week postpartum. Using a postpartum support girdle held everything in place so I could actually button my shirt. Especially after pregnancy, your back may be achy and weak from all of the pregnancy-related strain. If you also have issues like scoliosis, spinal curvature, and radiculitis, it might even be worse for you. Wearing a postpartum girdle is beneficial to help support your back and lessen any back pains. After childbirth, back pains are normal and it can be painful for moms, especially if you will be doing chores and other things that moms do. A postpartum girdle can help with alleviating some of this back pain to make your recovery and healing more bearable. Compression will usually improve your blood flow and help to minimize swelling. A postpartum girdle will help in speeding up the recovery time to reduce your uterus size after birth. After the past nine months, your posture could be greatly affected by pregnancy and so wearing a postpartum girdle can give you the extra help in making sure you getting your posture back to normal. It will help support your back muscles and straighten up your spine. If you went through a natural delivery, you can generally start wearing a postpartum girdle right away, however, it is best to consult your doctor about wearing a postpartum girdle (when you can start, what kind etc.) no matter if you had a vaginal delivery or a c section. On the average, postpartum support girdles are worn for around four to eight weeks. Every woman is different – you might heal quicker or slower than others. It is more beneficial to wear the girdle continuously for the first week. After the first week, you may only use it during the day and take it off at night. For women who had a c-section, stitches usually take around 4 weeks to heal and you can wear the postpartum during this period. I wore mine religiously for the first month and it made a huge difference in getting back to my pre-pregnancy size. This kind of postpartum support girdle can have a zipper either on the front or side. Zipper styles are the best postpartum girdles if you had a c-section since you don’t have to pull it on over your incision. There are snap and boning enclosures involved and provides great support for your back and lower abdomen. This girdle is like underwear with a very high waist. They are very easy to use. Are more suitable for moms who had a natural delivery. Consult your doctor before using this kind especially if you had a cesarean since you might wait around 2 weeks after birth before you can start using it. It helps with your posture and eases back pain. It has frontal flaps that wrap around your stomach and fastens at the back. It is adjustable using Velcro or hooks which means as you are losing weight, you can still use it. In my experience, I felt the wrap styles were the best postpartum girdles because it could adjust as my size shrunk down. Your girdle should not be too tight. Also, avoid itchy fabrics since it will only be uncomfortable for you. It shouldn’t feel like they are digging marks or tearing on your skin. You shouldn’t be struggling to put on your postpartum girdle especially during this time when you are extra sensitive. The best postpartum girdle is one that is easy to get into. Your postpartum girdle should not be moving around or sliding and shifting. Make sure you buy one that will stay in place or is the correct size for you. A breathable fabric is beneficial especially if you will be wearing your postpartum girdle a lot in order to keep you from feeling sticky and sweaty. The best postpartum girdles aren’t so thick and obvious that you can easily seem them under your clothes. Look for ones that are more discreet. There are a lot of affordable options out there and whatever your budget is, try to stick to it. If you invest in a good quality postpartum girdle, it can last you a long time and you can use it through multiple pregnancies. The best postpartum girdles will provide the right support and will help keep your posture straight. TWO SIZE AVAILABLE - One size version Waist belt -41.3" x 9", Fits waistline 26"-39",belly belt -37.4" x 9", Fits Stomach 26"-36.7" , Pelvis belt-- 43" x 6", Fits hipline 32.7"-42"***PLUS SIZE for weight of going to birth over 190lbs】size details please refer to the description. BREATHABLE & COMFORTABLE MATERIAL - 3 Belts in 1 set fulfilled all the needs throughout your postpartum healing process.Breathable & Comfortable material high quality lightweight fabric waist trainer cincher for women,This postpartum belly belt help you correct your posture.It also helps to avoid the belly band from rolling up when you seat or move, very comfortable, hygroscopic, breathable to wear and easy to clean. MULTIPURPOSE - Essentials for postpartum recovery helps get your body back to its former post childbirth.This postpartum belly band helps reduce swelling, support core abdominal muscles and return uterus to its original size sooner. It also makes you look instantly slimmer, adding confidence and helping you feel better after have a baby. ADJUSTABLE & GREAT FOR MOTHER - Allows put it on easily by yourself and pull is equal from both sides,readjust how tight you want it without taking off the band, keep you supported for a long time. It is GREAT GIFT for women just after giving birth or anyone had surgical operation resulting in loose skin and back pain.It also has built in boning to help support the lower back and improve posture during breastfeeding. SPEED RECOVERY & REDUCE DISCOMFORT - Helps ease transition of uterus and shrink it down to normal size, support your lower back and hold tummy in, redefine the waistline,relief back pain. Gives support for your belly, waist, and pelvis. 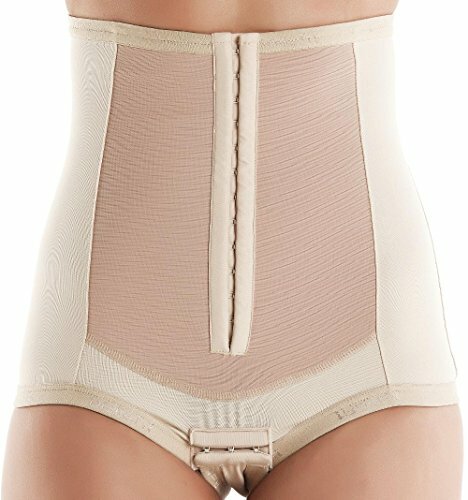 This postpartum girdle is great especially for those moms who just had a c section. Check out the Waist Trainer here. PERFECT 3 BELTS IN 1 SET - Postpartum belly belt contains BELLY BELT, WAIST BELT and PELVIS BELT in one set, fulfilled all your needs throughout the postpartum recovery process. This postnatal pregnancy wrap help you quickly restore body shape, ease postpartum discomfort, regain confidence. TWO SIZE AVAILABLE -【One size:】Waist belt fits waistline 26"-39", Belly belt fits stomach 26"-36", Pelvis belt fits hipline 32.7"-42".【Plus size:】for weight over 190lbs. Waist belt fits waistline 28"-41", Belly belt fits stomach 28"-39", Pelvis belt fits hipline 35"-44". If you are purchasing after birth, please choose the postpartum belt based on your current waistline size. BREATHABLE & COMFORTABLE MATERIAL - Made from high quality stretchable, lightweight fabric which helps you correct your posture. It doesn't roll up, very comfortable, breathable to wear and easy to clean. It can be worn under clothes. Ultra breathable to wear in all season. ADJUSTABLE & GREAT FOR MOTHER - Adjustable closure for easy wearing, helps reduce waist. It has a wonderful elastic type of way to keep your belly secure. You can readjust how tight you want without taking off the band, keep you supported for a long time. It is GREAT GIFT for women just after giving birth or anyone had surgical operation resulting in loose skin and back pain.It also has built in boning to help support the lower back and improve posture during breastfeeding. SPEED UP POSTPARTUM HEALING PROCESS & REDUCE DISCOMFORT - It speeds up the postpartum healing process by helping to ease the transition of the uterus and by shrinking it down to it's normal size. Support your lower back and hold tummy in, redefine the waistline,relief back pain, prevent organs/skin from sagging, accelerate postnatal healing. Essentials for postpartum recovery helps get your body back to its former post childbirth. Gives you full support in your midsection as well as your hips. It has 3 separate bands to provide you support wherever you need it. You can use it in the first week after delivery. Only 1 size so you don’t need to take measurements. Check out the Hip Mall 3 in 1 girdle here. 3 BELTS in 1 SET- Postpartum belly belt contains BELLY BELT, WAIST BELT and PELVIS BELT in one set, fulfilled all your needs throughout the postpartum recovery process. This postnatal pregnancy wrap help you quickly restore body shape, ease postpartum discomfort, regain confidence. TWO SIZE FITS MOST MOTHER- One size version for weight less than 190lbs【Belly belt fits stomach 26"-36.7" ,Waist belt fits waistline 26"-39" ,Pelvis belt fits hipline 32.7"-42"】, Plus size version for weight over 190lbs【Belly belt fits stomach 35"-40" ,Waist belt fits waistline 38"-44" ,Pelvis belt fits hipline 40"-46"】. If you are purchasing after birth, please choose the belly band based on your current size. ADJUSTABLE & GREAT FOR MOTHER--- Allows put it on easily by yourself and pull is equal from both sides, readjust how tight you want it without taking off the band, keep you supported for a long time. IT IS A GREAT GIFT for women just after giving birth or anyone had surgical operation resulting in loose skin and back pain. SPEEDS UP POSTPARTUM HEALING PROCESS--- Helps shrink belly, waist and hips;Prevent organs/skin from sagging;Relieve back & pelvis pain;Helps ease transition of uterus;Minimize stretch marks;Accelerates postnatal healing;Adds support while breastfeeding;Provides comfort after C-Section/ Natural delivery. Has 3 different belts. One for your belly area, a thicker one for your waist area, and another one to support your pelvis. Can suit moms who had a c-section. Check out the TiRain 3 in 1 girdle here. DOCTOR-RECOMMENDED FOR WEARING SHORTLY AFTER GIVING BIRTH - The Bellefit Corset is great for C-SECTION or VAGINAL BIRTH recovery. It is recommended to start wearing the Corset on the day you are discharged from the hospital. You will still see and the feel benefits and results of wearing a postpartum girdle within one year after giving birth. The Corset gives your core 360-degree compression and support to help you feel like yourself again and regain your mobility sooner. REDUCTION IN PAIN FROM PELVIC PRESSURE AND POSTPARTUM CRAMPS - As your uterus returns to its pre-pregnancy size you will experience cramping, also known as afterbirth pains. The compression from a Bellefit Corset helps you manage this pain by supporting your lower abdomen. The Corset also aids in the reduction of swelling by assisting your body to eliminate excess fluids. TRIPLE-LAYERED FRONT AND BACK SUPPORT PANELS - The Bellefit Corset is made with triple-layered reinforced front and back panels designed to target and support your core where it needs it the most. Bellefit girdles are made with microporous, hypoallergenic and breathable MEDICALTEX proprietary fabric that help protect your incision and your most sensitive areas as you heal. CONVENIENT GROIN FLAP CAN ACCOMMODATE POSTPARTUM HEAVY FLOW PADS - The Bellefit Corset has a convenient adjustable groin flap designed to accommodate bulky postpartum heavy flow pads. The groin flap can be easily opened so you can keep your corset on while using the restroom and changing your pads. ROWS OF ADJUSTABLE FRONT CLOSURES - The Bellefit Corset has two rows of front hook and eye closures that are separated by an inch apart so you can tighten or loosen your girdle as needed. BELLEFITFLEX technology adds flexible lateral spiral boning to help hold the girdle in place and prevent it from rolling. The lateral boning also helps to improve your posture. Boning on the sides and the compression fabric provides the support you’ll need. Check out the Bellefit Corset here. There are a lot of options out there when it comes to postpartum girdles. Which one on the list do you think is the best postpartum girdle?